New Jersey Governor Chris Christie was back in the Granite State Tuesday after getting a victory in his home state. New Jersey's State Supreme Court sided with the governor in a fight with public worker unions over pension funds. 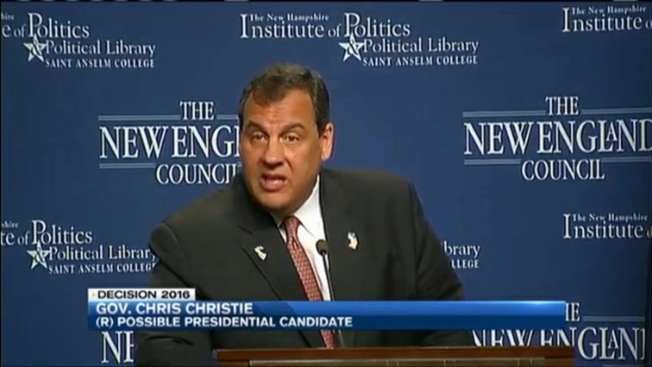 Meanwhile, Christie appeared at the "Politics and Eggs" event at Saint Anselm College in Manchester, New Hampshire, Tuesday morning, where he urged people to make national security a top priority. "In the Live Free or Die State, with the collection of veterans that you have in this state, who have put their lives on the line to protect this country, New Hampshire should lead on this issue," he said. Despite not formally declaring his candidacy, this is Christie's 40th visit to New Hampshire during the current campaign season. Carly Fiorina is also in New Hampshire on Tuesday. The former technology executive began her three-day visit Monday night in Londonderry, where she released a list of 13 New Hampshire endorsements, including the endorsement of Deputy House Speaker Gene Chandler. Fiorina, who will be in New Hampshire through Wednesday, is the only woman running in a field of more than a dozen declared or likely Republican presidential candidates.